Universität Hamburg has taken part in the annual Sustainability Action Days sincd 2015 with a lively program. Discuss scholarly issues in a relaxed atmosphere at one of the knowledge cafés initiated by the Center for a Sustainable University. Find out about past KNU events below. The Hamburg Sustainable Development Summit took place from 26–29 September 2017. How can we create viable networks to make universities more sustainable? What kind of sustainbility reports make sense for educational institutions? And can we even measure sustainable development? 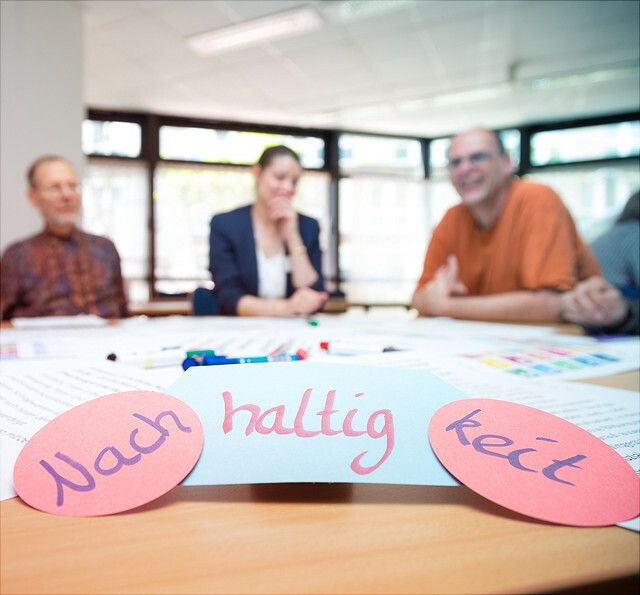 Roughly 40 participants from all over Germany discuss these and other questions when the working group Education for Sustainable Development (also known by its German acronym BNE) convenes on 19 March in the Yu Garden Tea House at Universität Hamburg. Read the German article about the BNE conference in the UHH-Newsletter archive. How can higher education institutions consolidate and systematize their sustainability reporting experience and activities? What kind of network do these issues require? Which scientific tools do we need to professionalize and reflect upon sustainability reporting practices at higher education institutions? Workshop participants met in July for 2 workshop sessions at the KNU, Universität Hamburg to discuss these questions. Colin Bien (University of Oldenburg), Katharina Liebscher (University of Bremen), Sophie Palm, Dr. Remmer Sassen, and Dr. Claudia Schmitt (all Universität Hamburg) also took part. Several other network members gave their input in writing beforehand. Read more about the Sustainability Reporting Network for Higher Education. Nahezu alle Veranstaltungen wurden aufgezeichnet und sind im Internet bei Lecture2Go abrufbar. Zudem werden sie ab dem 27. Januar 2016 im TIDE-Radio ausgestrahlt: jeden zweiten und vierten Mittwoch im Monat um 20 Uhr auf TIDE 96.0 und im Livestream unter www.tidenet.de. Am Montag, den 16. November 2015, fand das Jahrestreffen des KNU Postdoc-Kollegs „Sustainable Futur“ im Konferenzraum des HamburgischenWeltwirtschaftsInstituts (HWWI) statt. Nach einem Grußwort von Postdoc-Kolleg Leiterin Prof. Dr. Ingrid Gogolin und KNU Direktor Prof. Dr. Alexander Bassen bot der Abend ausreichend Möglichkeit zum Austausch: Das Kennenlernen sowie die Diskussion rund um gemeinsame Interessen und Perspektiven standen im Mittelpunkt des Treffens. Die Ringvorlesung „Nachhaltige Stadt der Zukunft“ mit insgesamt über 700 Teilnehmern an 13 Terminen erstreckte sich über das gesamte Wintersemester 2014 und wurde im Rahmen des Allgemeinen Vorlesungswesens von den Fellows des Postdoc-Kollegs Sustainable Future des Kompetenzzentrums Nachhaltige Universität organsiert. Ziel der Ringvorlesung war es, Herausforderungen nachhaltiger Entwicklung aus unterschiedlichen fachlichen Perspektiven am Beispiel des Raumes „Stadt“ aufzuzeigen. Die zweite Generation der Fellows im Postdoc-Kolleg “Sustainable Future” hat seit dem 1. Oktober 2012 ihre Arbeit aufgenommen. Auf der Begrüßungsveranstaltung am 31. Oktober 2012 tauschten sich die im KNU geförderten NachwuchswissenschaftlerInnen, die Mitglieder der KNU-Teams, die MentorInnen der Fellows und andere Gäste der UHH im Rahmen eines “Meet and Talk” nun zum ersten Mal in einer größeren Runde aus. Unter Deck des schwimmenden Wissenschaftszentrums „MS Wissenschaft“ zeigt die Ausstellung „Zukunftsprojekt Erde“ im Wissenschaftsjahr 2012 aktuelle Ideen aus der Forschung rund um das Thema Nachhaltigkeit. An Deck stellen sich VertreterInnen der Wissenschaft dem Dialog mit der Öffentlichkeit. Vom 26. bis zum 29. Juni lag das Schiff im Hamburger Traditionsschiffhafen vor Anker und am 28. Juni 2012 hieß es an Bord "Leinen los" für kontroverse Diskussionen zu Fragen wie "Wer soll die Energiewende koordinieren: Markt oder Staat? Wer trägt die Schuld an Problemschulen in Großstädten? oder Profitieren Bäume vom Klimawandel?" The KNU inaugurated a new series entitled Denkwerstatt Nachhaltigkeit 2.0 on 29 November 2012. The series brings together scientists, scholars, and people active in society and politics to discuss the university of the future. Among it's many activities, the KNU develops interesting ways to address the questions, problems, and challenges that sustainbility raises for research, teaching, education, and university management. It is designed as a laboratory for new types of exchange and participation. The first event in the series attracted about 40 people and was organized as a "world café" hosted by Julia André from the Körber-Stiftung. The Sustainable Future Postdoctoral College set up 4 tables with 1 fellow per table: Dr. Sönke Häseler, Dr. Silke Lautner, Florian Lottermoser, and Dr. Astrid Sundsboe respectively. 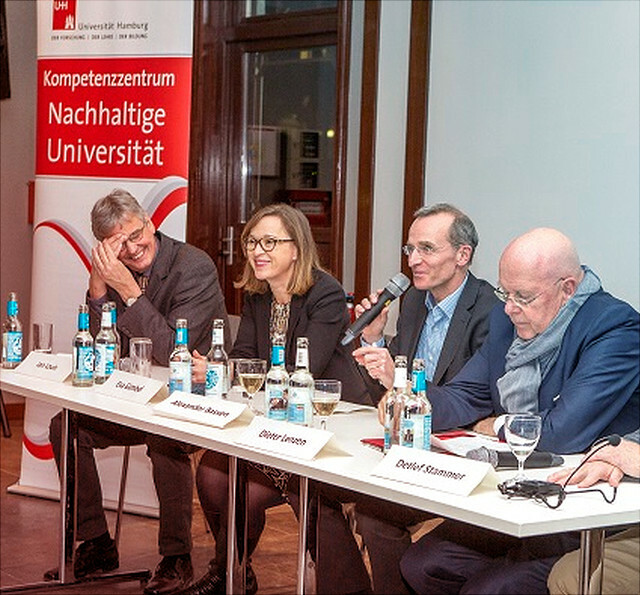 Professors, early career researchers, University administrative staff, and a few external guests were invited to take part in a lively discussion on 4 topics related to the question "How can Universität Hamburg become a sustainable institution?" Read more about the world café. The KNU's new series Denkwerkstatt Nachhaltigkeit 2.0 piloted a new type of participation on 17 December 2012: a virtual roundtable using the Synthetron method. This is a type of dialog that allows people to take part from anywhere: their office, home, or when they are out and about. Participants just need a computer with an Internet connection. What do you associate with the term "sustainable university" and why do these associations seem important? There are already many well-known individual projects and activities that help us navigate the path towards sustainability; what, from a holistic perspective, could really help these individual initiatives go forward? 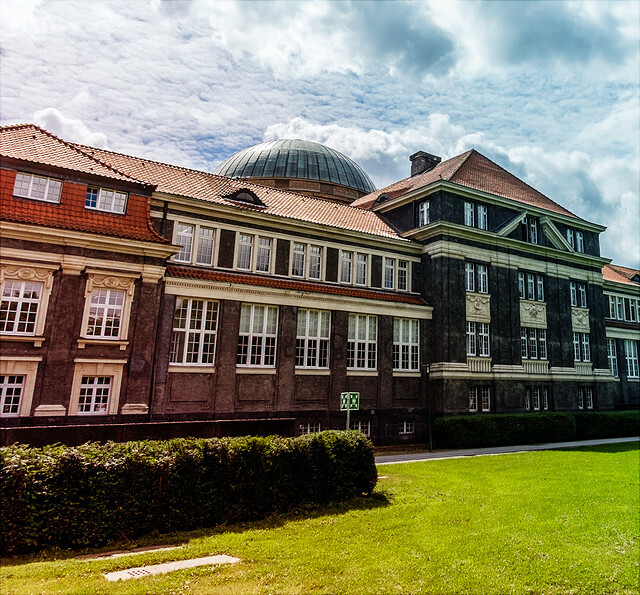 When you reflect upon where Universität Hamburg is on its path to sustainability, how many points on a scale of 0–10 would you give it? In light of your experience and against the backdrop of what we talked about today: what are the immediate organizational factors for success that we need to take into account? Where do we now need to place special emphasis? The Synthetron Method can be used from any location, online and anonymously, for a 1-hour brainstorming session in writing for groups of up to 750 participants. This innovative "participation architecture" in which the users are also designers was used for the first time at the University. At the opening event in December 2012 roughly 30 participants used this virtual space to test the online brainstorming tool for a dialog about the university of the future.